At five weeks, the pen has again been expanded to include a play area. 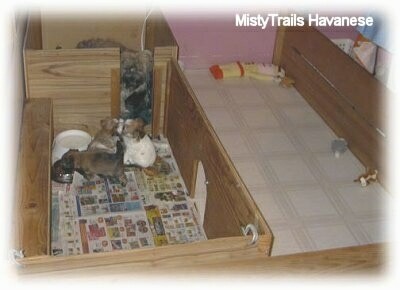 Pen specially designed for the Misty Method of housetraining very young puppies. A bowl of fresh water and dry kibble are always available. Puppies want to chew. Chew, rattle and pull toys have been added. 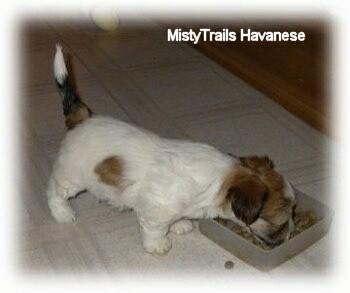 Feed three soaked meals of puppy food to pups daily. 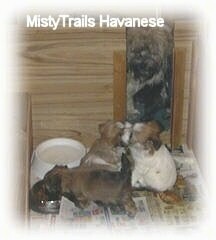 Start reducing the dam’s food to lessen her milk production, but keep her on puppy food for a few more weeks. 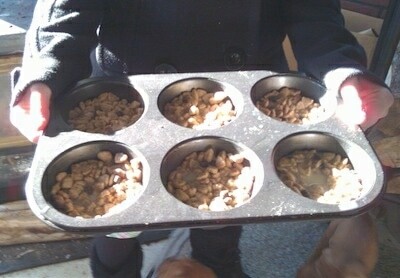 Feeding tip: When feeding the puppies, consider using a deep-dish muffin tin! They can't knock it over and each one gets its own little dish. 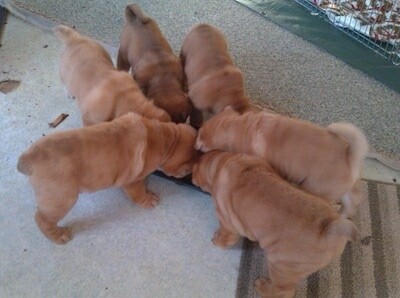 Shar-Pei puppies eating from a deep-dish muffin tin. 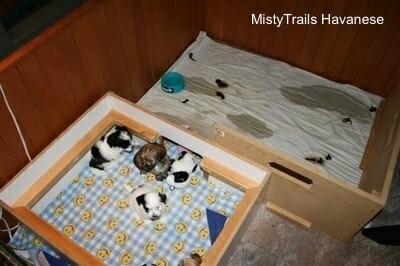 Five-week-old puppies learn there is a place to sleep and a place to potty. Call your vet and make appointments for 7.5 to 9 weeks (first booster shots). 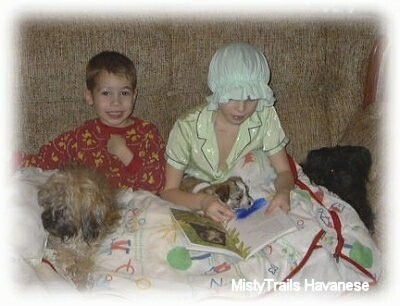 Puppies should have been wormed at 3 and 5 weeks with a mild wormer, and will need a stronger one at 7 to 8 weeks. Talk to your vet about this. Giving shots before 7 weeks is not advised. The second and third shot need to be done after 12 weeks to be most effective. The general guide is 8, 12 and 16 weeks for booster shots. 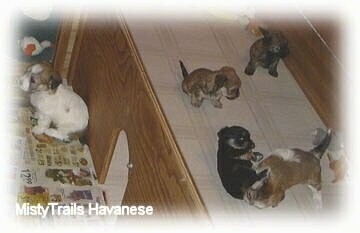 It is VERY important that puppies get individual attention at this age, including time separated from littermates. 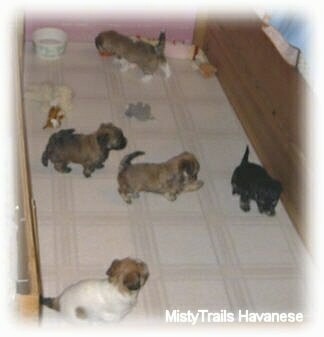 Pups getting socialized; notice one of the pups heading in to the paper area to pee. This early socialization has been proven to benefit the puppy in later years. Scientific studies have shown dogs that receive this early proper socialization actually have increased brain mass. They are also better at problem solving, and make much more enjoyable, intelligent companions. 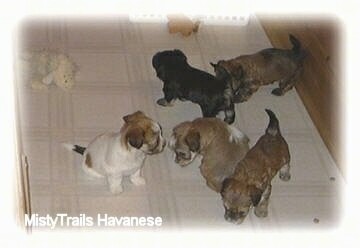 These eight puppies are only five weeks old. There were 16 poops and pee in the night, and all of it is on the paper. "The stools are a little soft, as I just wormed them. It is important to worm your puppies every two weeks. I use a mild wormer at 2 and 3.5 weeks, and a little stronger one at 5 and 7 weeks." "In the morning when I wake up to this poop, I quickly just COVER it with another piece of paper, as shown above. Then after they all say hi and have breakfast, I change all the paper while they are eating. Remember before five weeks, you leave the smelly poop there to attract them, and just cover it. But once they catch on and always use the paper you can keep it clean and change it more. 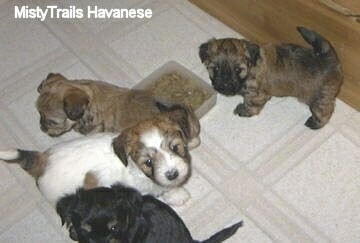 Do not leave the exposed poop for the puppies to run through and track all over. You do NOT want the puppies’ feet to be covered in poop (or bodies when they start to play and roll). A sign that a puppy has not been raised in a clean environment would be yellow/brown stained legs. 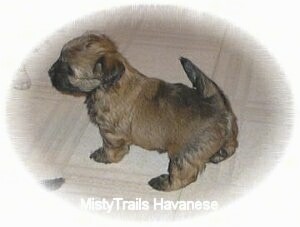 Remember, this EARLY training from a breeder makes it much easier for the new owner to train the puppy."